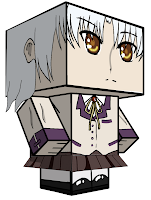 This cube craft paper toy is the Kanade Tachibana, based on the anime series “Angel Beats!“. This paper craft is designed by blackignus. Kanade Tachibana is one of the students of the afterlife school and the said school’s Student Body President. She is also called as Angel by the Afterlife War Front, a nickname is coined by Hideki Hinata and was later used by the group’s leader Yuri Nakamura to refer to her after discovering her unusual abilities.